I was in dire need of a new hairstyle — after it had been pointed out to me more than once that I’ve always had bangs. So I decided to see what growing out short hair is like… and I documented the entire process. Here’s how to grow out short hair (starting with your bangs), how long it takes to achieve a new hairstyle, how to make your hair look better during the “in between” stages, and how to cut bangs yourself. Everything you need to know before growing out bangs and going from a short hairstyle to a medium one. Epilators are better than shaving and waxing — especially for women with darker hair. I’ll explain why. I’ve also got 4 great tips for when and how to use your epilator. Plus I’ll review my all-time favorite epilator: the Emjoi Epilator and give you even more information on other Emoji products. Fun Beauty Tip: Mix Argan Oil With Essential Oils To Make Your Own Scented Argan Oil! Read this before you combine Essential Oils with Argan Oil. Here’s how to combine regular Argan Oil with Essential Oils to make your own scented Argan Oil. 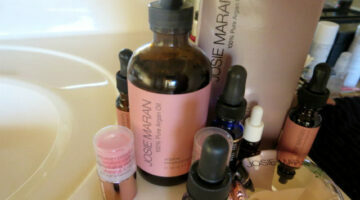 My Favorite 100% Pure Argan Oil Uses: See How I, My Husband, And My Dog Use Argan Oil Daily! I’m addicted to 100% pure Argan Oil as a daily moisturizer! It helps your skin & your hair – even your hubby’s & your dog’s! Whether you’ve got bad morning hair, hat head, or helmet hair, here are a few DIY solutions to help you look your best in SECONDS! Morninghead vs washcloth. For your hair’s sake, you want to choose hair-friendly elastic hair ties that can be easily taken out without too much damage to your hair. You also want to ensure that the bands you choose will be able to hold your ponytail in place for the entire day. Here’s a run-down of the best hair elastics available today. The high ponytail will always be in style. It’s been around forever and isn’t going anywhere soon and I am telling you exactly how to create these timeless ponytail hairstyles. 40 great ideas for all hair types! Anyone who wears their hair in a ponytail — including both guys and girls — will benefit from these helpful tips. Baking soda is an excellent base for healthy homemade remedies and beauty aids. Here are 8 wonderful recipes taht are inexpensive and very effective. Great alternatives to pricy store-bought products. Here’s what I do to keep my hot curling iron from touching things that could melt or burn… I simply use a silicone trivet or a silicone hot pad. Yep, these are items that you probably already have in your kitchen! The idea of using dry shampoos wasn’t really a stretch for me. I’ve been using baby powder in between hair washings for several years now. Dry shampoos are just that next step toward cleaner, fresher smelling, healthier hair. See why I love dry shampoos, plus other video reviews. Laser Back Hair Removal For Men: Is It Better Than Waxing? Better Than Electrolysis? Laser back hair removal is an FDA-approved method of safe hair removal that is a more permanent solution than the use of hair removal creams, waxing, electrolysis, and shaving. A strange but true story about my hair accessories matching my watch bands.